Reading has to make sense to your child. When choosing books to use as you begin to teach reading, make sure there are complete sentences – one simple sentence per page. And that there is a very simple story line. This helps make the reading meaningful. There isn’t much meaning in a bunch of letters and sounds so if you’re teaching your child to read only through phonics, that is, by sounding out the letters, the reading will not be meaningful. And you’ll be severely limiting your child’s reading tool box. Phonics is just one of the tools, but the “mega-power tool” is the meaning strategy. Reading for meaning is the most powerful reading strategy that we use. When your child is attempting to read a sentence and comes to a word she doesn’t know, the most powerful thing you can ask is: What word would make sense here? You can also add: Look at the picture. You said________. That doesn’t make sense. You could add: What would make sense? Look at the picture. Or, think about the story. With all of these prompts, you’re appealing to meaning. You’re teaching your child to think for herself. You’re not asking your child to “sound it out”. When a child tries to only say the sounds, meaning is lost. So, how do you teach your child to use this strategy while reading a book? It’s really quite simple and flows naturally. One of the most obvious ways to teach the meaning strategy is through the use of pictures. To demonstrate, I’ll be using one of the books from the Super Hammy – My First Reading Series which I just happen to have written. The first thing to do is show your child the cover and say the title. Point to it. Ask your child what’s in the picture. Talk about the different characters and objects. What do you think the story will be about? This is the beginning of putting the meaning of the story into your child’s head. This is important because your child will be able to predict what some of the words in the story might be. Being able to predict what word might come next in a sentence is very important, too. Next, do a quick picture walk through the book without reading it. Briefly describe what’s in the picture. Your child will be able to predict which words will be on the page once he begins to read. As you read point under each word. Read: “Come and see the —-” Stop and point to the picture. Your child will likely say “pumpkin”. Do the same with each page. Point under each word as you read out loud. Read: “Come and see the —-” Stop and point to the picture. Your child will likely say “vampire”. Read: “Come and see the vampire.” Ask your child if this makes sense? Yes. Because there’s a vampire in the picture. Your child is using the pictures to derive meaning. The picture is helping your child to figure out the word. Never cover up the picture! Do not test your child this way. The pictures are a vital part of the story, and, in books for emergent readers are specially designed to heavily support the text or words. Encourage your child to use the pictures when she comes to a word she doesn’t know. Ask: Can the picture help you figure out the word? Does it make sense? It’s important to point under each word as you read. You’re showing your child that we read from left to right. You’re also demonstrating that there is a match between the word you say and the word that you see on the page. Teachers call that one-to-one matching. There’s a surprise ending to Super Hammy’s Hallowe’en! The Super Hammy – My First Reading Series is a great set of books to have on hand when you’re beginning to teach reading to your child. The books have been designed to increase very gradually in complexity and the pictures heavily support the text. 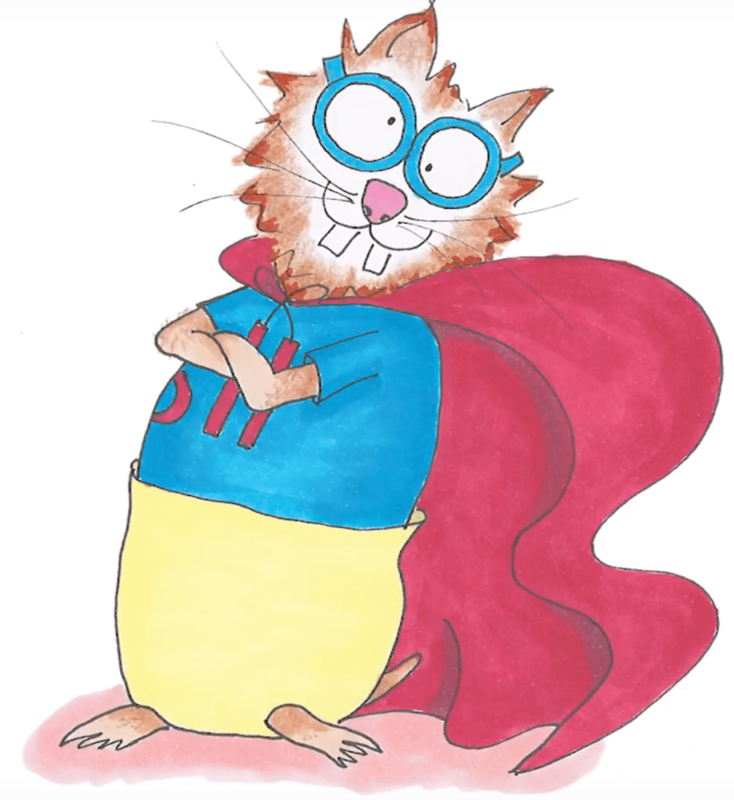 Follow the adventures of a super hero hamster, Super Hammy, and his friend, Little Mouse, and bad guy, Bad Cat. To purchase Super Hammy books now click HERE! Super Hami est disponible en français! Cliquez ICI! Next Teaching Reading – Does it sound right?